SimpleAgenda is a simple calendar and agenda application. 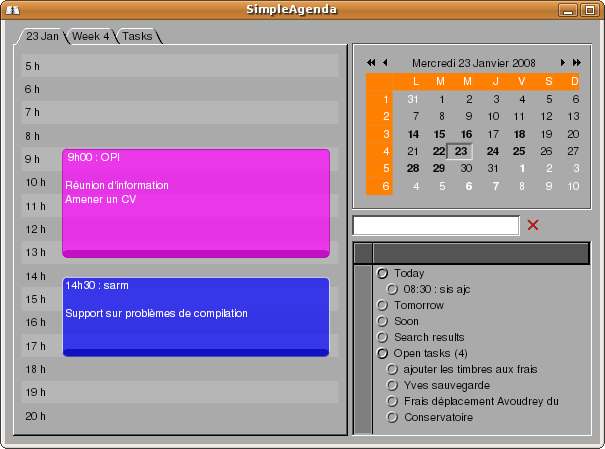 Based on libical, SimpleAgenda handles multiple local and distant (through webcal) calendars. You can share your calendars with Mozilla Calendar, Evolution and possibly others. It works for me but backup your data if it's really important ! SimpleAgenda requires the latest GNUstep stable release. The last version of libical that works with it is 0.48 due to API breakage. Check the project homepage for detailed features. This page was last modified 16:27, 21 February 2019. This page has been accessed 124,493 times.